– Diabetes mellitus – type 1 or insulin dependent diabetes. Accounts for about ten percent of diabetes cases and occurs mostly in children. Type 1 diabetes occurs because the pancreas cells that manufacture insulin no longer work or are manufacturing only a small amount of insulin. With out insulin, blood sugar can not be utilized and the body uses fat and muscle protein for energy instead. – Diabetes mellitus – type 2 or non-insulin dependent. 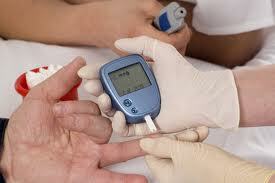 Accounts for about ninety percent of diabetes cases and occurs mostly in adults over forty. Type 2 diabetes occurs because the insulin that is produced by the pancreas is not effective. * Diabetes may cause other disorders if left untreated, including blindness, stroke, high blood pressure and heart disease. Complications are the third leading cause of death in the US today. * Type 1 diabetes – causes include genetics, autoimmune disorder, race – Caucasians are at higher risk, viral infection, and drugs. * Type 2 diabetes – causes include genetics; race – Native, Hispanic, Asian and African Americans are all at higher risk; obesity – over ninety percent of type 2 patients are obese; age – people over fifty are at higher risk; and sedentary lifestyle. * Other diabetes may be caused by pregnancy, underlying disorders and poor dietary habits. * Type 1 diabetes – symptoms include nausea or vomiting, abdominal pain, fatigue, bed wetting – especially in children, blurred vision, constant thirst, increased urination, irritability, muscle weakness, weight loss and hunger. 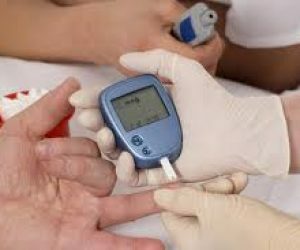 * Type 2 diabetes – symptoms include drowsiness, inability to taste sweet foods, constant thirst, itching, nausea, blurred vision, muscle weakness, skin infections, abdominal pain, increased urination, slow healing wounds, fatigue, numbness in the feet and leg pain due to nerve damage or loss of circulation. * Address Obesity Problems – symptoms of type 2 improve when weight is reduced. Excess weight increases the chances of becoming pre-diabetic, and this may be reversed with weight reduction. Although obesity does not cause type 1 diabetes, it does increase the need for higher doses of insulin and should be avoided if possible. * Quit Smoking – smokers are at higher risk of developing diabetes and other related diseases such as heart disease, hypertension and kidney damage. Smoking also reduces oxygen circulation to the peripheral blood vessels and may contribute to feet and leg disorders or injuries. * Do Not Drink Alcohol – drinking increases the risk of developing diabetes and diabetics who drink increase the risk of eye and nerve damage. * Exercise – people who exercise reduce the risk of developing type 2 diabetes, as they are less likely to become obese, and exercise improves insulin sensitivity. People with type 1 diabetes and who exercise require less insulin. Before undertaking an exercise regimen, it is important to consult your physician, as exercise does affect glucose levels. * Eat A High Fiber and Complex Carbohydrate Diet – fiber helps to stabilize blood sugar levels by slowing the rate of absorption of glucose into the blood. Include foods such as oatmeal, legumes, vegetables, whole grains, root vegetables, fenugreek and psyllium. * Eliminate High Sugar and Starch Foods – these contribute to swings in blood sugar levels. * Adopt A Vegetarian Diet – vegetarians are at a reduced risk of developing type 2 diabetes. Meat and dairy foods contribute to heart disease, which is one of the leading causes of deaths in diabetics. The reduced protein intake from a vegetarian diet helps to lower the incidence of kidney damage, which is also seen in many diabetics. * Eat plenty of brewer’s yeast, berries, spirulina, garlic, kelp, soybeans, and vegetables as these help to stabilize blood sugar levels. * Diagnose Allergies – food allergies are thought to contribute to the development of type 2 diabetes and to exacerbate diabetes. * Reduce Intake of Dairy Products – especially in young children, as type 1 and type 2 diabetes occurs more frequently in people who consumed dairy products early in life. * If symptoms of hypoglycemia develop immediately consume something that contains sugar. If there is no improvement within twenty minutes consume some more sugar. Again wait twenty minutes if there is no improvement, seek medical help. * If symptoms of hyperglycemia develop immediately seek medical attention. * Type 1 diabetes – need to manage blood sugar levels with insulin dosing. Diet and lifestyle will also help the type 1 diabetic. Type 1 diabetics need close consultation with their physician to manage their disorder. * Type 2 diabetes – diet and lifestyle are the major therapies used. However sulfa drug therapy is used in some cases. These drugs have limited use as effects are usually short lived and produce serious side effects. Sometimes insulin is used if other treatments do not work. BIOTIN – helps the metabolism of glucose and the use of B group vitamins. Natural sources of biotin include brewer’s yeast, whole grains and soybeans. Up to 50 mg daily in divided doses may help improve symptoms. Note that raw egg, heated oils and fat, saccharin and antibiotics may inhibit the absorption of biotin. VITAMIN B12 – CYANOCOBALAMIN – helps to reduce nerve damage in diabetics. Natural sources of vitamin B12 include seaweed – dulse, kelp, kombu and nori, soy products, alfalfa, brewers yeast and hops. Injections of up to 500 mcg are recommended. See your physician for injections. VITAMIN E – helps to improve glucose intolerance in type 2 diabetes and improves circulation. Natural sources of vitamin E include watercress, alfalfa, seaweed – dulse and kelp, oatmeal, legumes, sweet potatoes, nuts, leafy green vegetables, seeds and dandelion. 400 – 900 iu daily in divided doses may help with symptoms. Take according to label instructions if you suffer from diabetes, overactive thyroid, or are taking anticoagulant medication. CHROMIUM – chromium picolinate. Improves glucose tolerance and reduces blood sugar levels by increasing sensitivity to insulin in both type 1 and 2 diabetes. Picolinate helps the body to use the chromium. Natural sources of chromium include brewer’s yeast, corn, potatoes, blackstrap molasses, whole grains, dried beans and brown rice. 400 – 600 mcg daily in divided doses may help if you have diabetes. Consult your physician before taking chromium supplements. MAGNESIUM – – reduces the amount of insulin needed in diabetics. Magnesium deficiency may also be linked with this disease. Natural sources of magnesium include cantaloupe, lemon grass, parsley, peppermint, soy products, lima beans, citrus fruit, sesame seeds, blackstrap molasses, leafy green vegetables, seaweed – dulse and kelp, bananas, torula and brewer’s yeast, apples and brown rice. 300 – 600 mg daily in divided doses may help with symptoms. Consult your physician before taking magnesium if you have a kidney disorder. ZINC – lowers blood sugar levels and zinc deficiency has been linked to diabetes. 15 – 50 mg daily in divided doses of zinc gluconate lozenges may help with symptoms. Natural sources of zinc include brewer’s and torula yeast, pecans, parsley, sunflower and pumpkin seeds, soybeans, seaweed – dulse and kelp, mushrooms, rose hip and alfalfa. Take according to label instructions if you suffer from diabetes, overactive thyroid, or are taking anticoagulant medication. BILBERRY – European blueberry and bilberry leaf tea. Helps to stabilize blood sugar levels and is a traditional remedy for diabetes in Europe. Bilberry may also help to reduce the risk of eye damage caused. 300 – 500 mg daily in divided doses may help. Make tea according to label instructions. DANDELION – Dandelion Root – helps to stimulate the pancreas. Take according to label instructions. Avoid dandelion if you have ulcers or gall stones. FENUGREEK – improves glucose tolerance, decreases blood sugar levels and provides fiber to help slow the absorption of sugar into the blood stream. Use defatted powdered fenugreek supplements according to label instructions. GINKGO, MAIDENHAIR TREE – increases circulation to the brain and limbs and is used to treat symptoms of peripheral vascular disease caused by diabetes. 100 – 250 mg daily of gingko supplement may help with symptoms caused. Take for at least two weeks for maximum benefit. GINSENG – reduces fasting blood sugar levels, improves circulation, stimulates the release of insulin, and may increase the number of insulin receptors. Is used to treat diabetes. 200 mg daily may help with symptoms. Do not use if you have untreated high blood pressure or are pregnant.